Last month my Satria met a minor accident where I ran over a big pot hole and caused my bumper cracked. Do follow the post here. 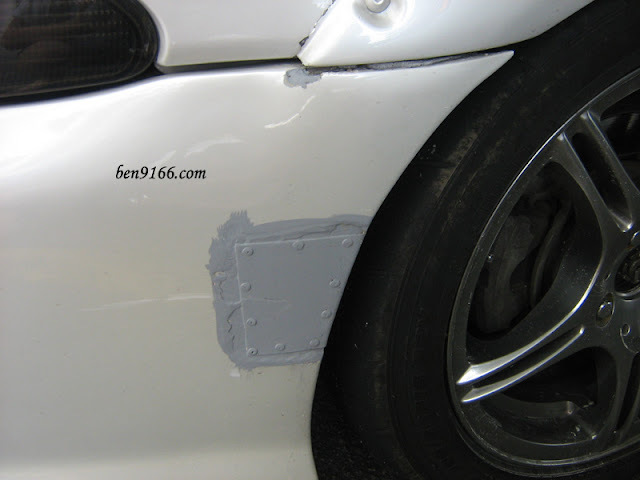 Thinking of changing to a new bumper but it will cost me few hundred bucks without paint. To me exterior is not that important and I rather to spend this amount of money to improve my Satria performance. Therefore I decided to repair the bumper and now the car is back from the workshop.. The mechanic used a piece of metal to hold and cover up the crack area of the bumper. According to him, the bumper is make from FPU and there is no support at the middle of the side bumper so adding the metal will help to increase the bumper "strenght". Not pretty sure how much since my dad helped me to send it to workshop but anyway galded that the car is back and I am happy with the fix although I have not paint it yet.